GRAND RAPIDS – Harold Altenburg once dreamed his farm would someday be a place where students could visit, work and learn more about agriculture. Today, Altenburg is preparing for retirement, his farm is called The School at Altenburg’s Farm. Six people make up a board of directors for the nonprofit farm school, and a farm director has been chosen to work on the farm. Altenburg is still involved, acting on the advisory committee. At a meeting there this week, Brad Kremer, a farmer in the Pittsville and Vesper area who serves as the president of the board, introduced the team. Kremer said after months of work, the group set up the farm as a nonprofit organization, created bylaws, elected officers and hired Greg Gerdes to be the farm director. The group also has plans to expand on existing partnerships with local schools and provide learning opportunities to communities regardless of age. Tracy Neve is an instructional technology coach and mentor for the Auburndale School District and serves on the farm school’s board to lead the education committee. Neve said the group already has plans for learning events in August to discuss pesticides, herbicides and GMOs. “We also have been looking into bringing out some gardening classes, so that we can learn more about that as a community for young and old alike,” Neve said. 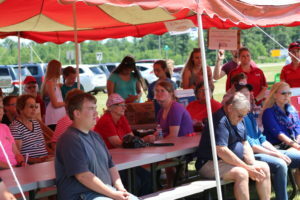 Students interested in agriculture attended the event Wednesday to help serve strawberry sundaes and show their support and interest in the farm school. Rhett Reinicke will be a senior at Lincoln High School. Dan Smith of the Wisconsin Department of Agriculture, Trade and Consumer Protection said Altenburg’s vision fits with the organization’s values, focusing on children, communities, agriculture and natural resources. Smith said far fewer people are involved in agriculture now than ever before, and that’s what makes agriculture education important. Altenburg told the group his idol is Bart Starr, who did great things on the football field, but even greater things in the community, such as his program for at-risk youth in Wisconsin. Altenburg hopes providing work and educational opportunities at the farm can help prevent youth from making bad choices. For more information, visit altenburgsfarm.com or find The School at Altenburg’s Farm on Facebook.